Originally from Lancaster, Pennsylvania, Mark Hibshman graduated from West Chester University in West Chester, PA with both a Bachelor of Music in Music Education and a Bachelor of Arts in Trumpet Performance. He was awarded a graduate assistantship by the University of Louisiana-Lafayette and earned a Masters Degree in Trumpet Performance. From there, he was awarded a Graduate Fellowship and assistantship from the University of North Carolina - Greensboro, where he pursued his doctorate from 2002-2006. His teachers have included Frank Kaderabek, Dr. Kenneth Laudermilch, Dr. Paul Morton, and Dr. Edward Bach. 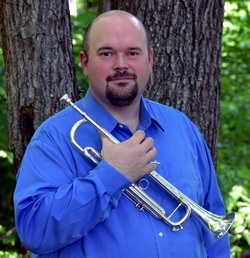 Mark is an active performer throughout the state and is second trumpet in the Salisbury Symphony, Repiano cornet in the North Carolina Brass Band, performs with the Western Piedmont Symphony, and regularly performs with many other groups including the Piedmont Wind Symphony and the da Capo Brass Quintet. Outside of the state, Mark has performed with the Lancaster Symphony Orchestra, the Acadiana Symphony Orchestra, and was a member of the Louisiana (Lafayette, LA) and Capitol Brass Quintets (Dover, DE).